Login to StaffWeb fails when using the Internet Explorer web browser. Update 2012-09-06: Some versions of IE are now working. Currently it is not possible to login to StaffWeb using IE (Microsoft Internet Explorer) web browser. This issue actually affects other CU services as well, including Google Calendar. CUIT is actively working on the problem, although a timetable for a fix has not been announced. We'll keep you posted. In the meantime, all other browsers should work. Some forms from various units have not yet been migrated to new StaffWeb. Update 2012-09-16: Migration of the CUL Email Alias Maintenance Form is in progress. All other forms have been migrated. We're still working to migrate a number of the web forms available on StaffWeb. This transition should be completed soon. In the meantime versions of the old forms should continue to be fully functioning and directly accessible through links on the new site. Unlike old SWIFT, the new StaffWeb currently requires you to login to access top-level pages, including the StaffWeb homepage. We expect to have the old behavior restored soon, keeping in mind that StaffWeb is for CUL/IS staff, and access to anything but top-level menu pages will still require UNI login. StaffWeb search is still indexing old SWIFT rather than new StaffWeb. Update 2012-09-06: CUIT is in the process of updating the GSA infrastructure. That work is expected to be comleted by 2012-09-16, afterwhich the Libraries will be able to make the necessary changes to StaffWeb search indexes. The CUIT Google Search Appliance (GSA) which powers the Libraries' website searches including StaffWeb has not yet been reconfigured to index the new website. We're working with CUIT to make the updates and expect the results to reflect those changes soon. StaffWeb search still has the old SWIFT look and feel. The StaffWeb search results screen is among a few services outside of the CQ Web CMS which needs to have its design updated to the new look and feel. We'll be working to update the search interface as soon as developer resources become available. 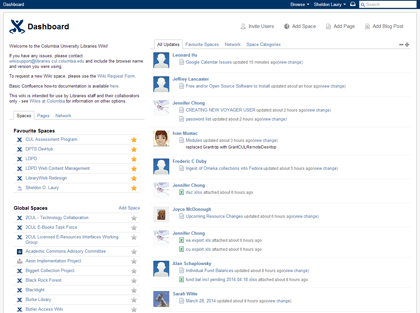 Some content, primarily related to web development, has not yet been migrated to new StaffWeb. There is still some content (image galleries, sitemaps, etc.) which remains to be migrated into the CQ Web CMS. This work will be pursued as time allows in the context of competing priorities. Most of this content is related to web development, and remains available on old SWIFT. If there's particular content you consider a priority for migration, please let us know. Staff-oriented blogs still have the old SWIFT look and feel. Staff-oriented blogs are among a few services outside of the CQ Web CMS which need to have their design updated to the new look and feel. This work will be deferred until after the completion of competing priorities and in the context of other upgrades to the blog infrastructure. If you encounter missing content or other problems with using StaffWeb, please notify the web team by sending email to staffweb@libraries.cul.columbia.edu. Thanks to all of you for your patience and support! This entry was posted in Transition to New Web CMS, Websites (CQ/AEM) on August 22, 2012 by Dmitri. Welcome to the new StaffWeb site, https://culis.columbia.edu/! Besides the new look and feel, some other things are noticeably different. It was determined by content owners that some of the content in the old site was no longer needed, so that content is not there. Work is still underway to complete the transition. If you notice that some things are not yet there, please send email to staffweb@libraries.cul.columbia.edu. The forms have not yet been completely migrated, and other content may need to be incorporated. A link to the old SWIFT site is available in the Spotlight area on the new homepage, so you can continue your migration efforts and check the content. We know there are still some things missing from the new StaffWeb site, such as some of the forms and website search. Please let us know if you haven't been able to finish migrating your content, so we can respond to questions and alert staff to what is still missing. The sites will be up in tandem for some time during this transition to ensure that issues and problems can be identified and addressed as needed. Many thanks to all who have contributed to our transition! A special thanks for our hard-working contributors who migrated their own content into CQ! Thanks to the content owners for reviewing all the pages and identifying the content that needed to be kept! Thanks to Yasmin Salehizadeh for her help with content migration, Dmitri Laury, Eric O'Hanlon, and Erik Ryerson for building the site, to Erik Ryerson for the new design, and to Candice Kail for managing the entire process. Thank you all for your patience with this transition! Enjoy the new site! 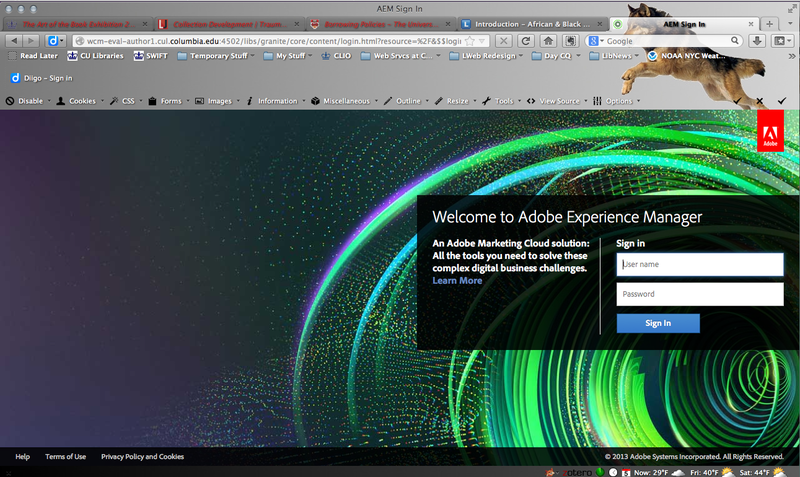 This entry was posted in News and Updates, Transition to New Web CMS, Websites (CQ/AEM) on August 17, 2012 by Candice. On Monday, 23 January, we completed the system and server upgrade work. 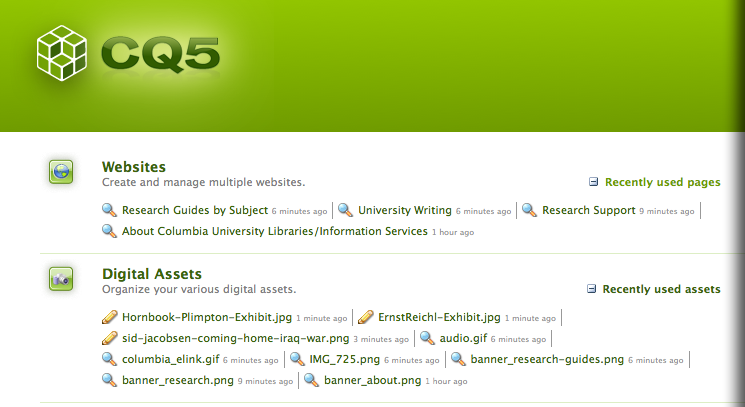 CQ 5.4 is now up and running. We are continuing the process of cleaning up LWeb content as needed following the system changes. We will be providing ongoing information about the improvements and changes that 5.4 brings. This entry was posted in Transition to New Web CMS, Websites (CQ/AEM) on January 25, 2012 by Candice. We’ve started rolling out CQ to contributors, and we will be holding up to 10 sessions in May depending on need and availability. Please RSVP to the training invitations (sent via email) as soon as possible. We’ve held a few sessions already and continue to improve our documentation and the training materials. We are continuing to work on problem reports and are concentrating on getting the Area Studies content migrated into CQ. I hope to have policies and guidelines online for contributors within the next two weeks. They’ll help us keep the site accessible for those with disabilities and will also help to improve our user experience by incorporating some key user-centered design principles. This entry was posted in Training and Workshops, Transition to New Web CMS, Websites (CQ/AEM) on May 6, 2011 by Candice. Thank you all for your continued patience during our implementation process! We are working through problem reports and handling content issues as they arise. We are scheduling training sessions, which will begin Monday the 25th, and will be in touch about the upcoming schedule and to continue to update you about our CQ implementation. This entry was posted in Transition to New Web CMS, Websites (CQ/AEM) on April 21, 2011 by Candice. Please join us for a brown bag question and answer session about CQ and the LibraryWeb implementation today from 1:00 – 2:00 in Butler 523. This entry was posted in Transition to New Web CMS, Websites (CQ/AEM) on March 15, 2011 by Candice. Thanks to Stephen Davis, Patricia Renfro, Damon Jaggars, and Bob Wolven, who worked with us to make this project a reality. Thanks to everyone in LDPD for their support and assistance, particularly Joanna DiPasquale, Dmitri Laury, Stuart Marquis, Erik Ryerson, and Donna Sy. Please report any problems you find using our website problem report form on SWIFT: https://www1.columbia.edu/sec/cu/libraries/staffweb/web/forms/website_problems.html. Over the next week, we will be monitoring the site, updating the things we know need to be updated, and making necessary tweaks.We will begin scheduling training sessions the week after spring break. I will be in touch that week with contributors as I build the schedule. We are planning a CUL/IS Open House to celebrate the change and will be in touch with details. This entry was posted in Transition to New Web CMS, Websites (CQ/AEM) on March 12, 2011 by Candice. Going Live Friday at 5:00! We are launching the Libraries’ Website (LWeb) via CQ this Friday, 11 March 2011, at 5:00 p.m! Reminder: This Friday, 11 March 2011, the Libraries website (LibraryWeb) will be relaunched via our new web CMS with the new URL http://library.columbia.edu/. Traffic will begin being redirected at 5:01 p.m., although it will take some time before the entire site is up and running. We will provide more details about the launch through the weekend and the coming weeks. We will be monitoring the site and making necessary changes throughout the weekend. Over the week of Spring Break (14 – 18 March), we will be soliciting your feedback and asking you to review the site. I will be posting information about site review and testing tomorrow. Please note: as mentioned in previous posts and announcements, Area Studies (including the WWW Virtual Library sites) links will remain the same until further notice. This entry was posted in News and Updates, Transition to New Web CMS on March 9, 2011 by Candice.